Mega Swag Bucks Day Is Here! It’s time for Mega Swag Bucks Day! If you’re new to these parts, it’s a day of big wins and big bucks – Team Swagbucks is giving away more than 1,000,000 Swag Bucks in TODAY. Today you have a chance of winning even crazier amounts of Swag Bucks with your searches. From 30 to 1,000 Swag Bucks on ONE search! It’s not a guarantee, but it definitely makes things exciting! If you want proof, go to the Swag Bucks Twitter feed. You’ll see lots of RTs (retweets) of users like you. If you’re lucky enough to win a Mega Bill (A Bill worth over 10 Swag Bucks) today, take a screen grab of that and upload it to Twitter with TwitPic or YFrog or any other service compatible with Twitter (there are TONS). 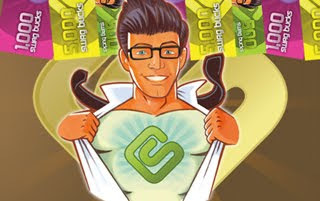 Include “@Swagbucks” and “#MSBD” in your tweet and if TSG sees it, it’ll be retweeted on the Swagbucks Twitter page. Let Swaggernauts far and wide revel in your victory! Also, check out the Mega Swag Bucks Day page, where you can follow along with our twitter feed, follow the #msbd hashtag and count the bucks as the accumulate!